The Godzilla film franchise, which began in 1954, has been rebooted numerous times. 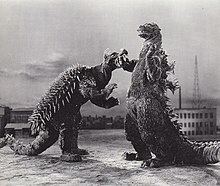 Pictured here is a promotional image from Godzilla Raids Again (1955). In serial fiction, a reboot is a new start to an established fictional universe, work, or series that discards all continuity to re-create its characters, plotlines and backstory from the beginning. It has been described as a way to "rebrand" or "restart an entertainment universe that has already been established". Another definition of a reboot is a remake which is part of an established film series or other media franchise. The term has been criticised for being a vague and "confusing" "buzzword", and a neologism for remake, a concept which has been losing popularity in the 2010s. The term is thought to originate from the computing term reboot, meaning to restart a computer system. Reboots cut out non-essential elements associated with a pre-established franchise and start it anew, distilling it down to the core elements that made the source material popular. For audiences, reboots allow easier entry for newcomers unfamiliar with earlier titles in a series. In comic books, a long-running title may have its continuity erased to start over from the beginning, enabling writers to redefine characters and open up new story opportunities, allowing the title to bring in new readers. Comic books sometimes use an in-universe explanation for a reboot, such as merging parallel worlds and timelines together, or destroying a fictional universe and recreating it from the beginning. With reboots, filmmakers revamp and reinvigorate a film series to attract new fans and stimulate revenue. A reboot can renew interest in a series that has grown stale. Reboots act as a safe project for a studio, since a reboot with an established fanbase is less risky (in terms of expected profit) than an entirely original work, while at the same time allowing the studio to explore new demographics. Reboots also allow directors and producers to cast a new set of younger actors for the familiar roles of a film series to attract a younger audience. Unlike a remake, however, a reboot often presupposes a working familiarity on the part of the audience with the original work. In television, a reboot of a TV show can be a return to production after cancellation or a long hiatus, but is also understood to mean a remake of an older series. Reboots are common in the video game industry, particularly with franchises that have multiple entries in the series. Reboots in video games are used to refresh the storyline and elements of the game. ^ a b c d Willits, Thomas R. (13 July 2009). "To Reboot Or Not To Reboot: What is the Solution?". Bewildering Stories. Archived from the original on 6 December 2012. Retrieved 20 August 2013. ^ a b c Parfitt, Orlando (25 August 2009). "Top 12 Forthcoming Franchise Reboots". IGN. Archived from the original on 20 May 2014. Retrieved 20 August 2013. ^ Alexander, Julia (March 15, 2017). "The Matrix reboot isn't a remake: Here's the difference between the two". Polygon. Retrieved July 19, 2018. ^ McKittrick, Christopher (March 6, 2018). "Film Franchises: The Differences Between Sequels, Reboots and Spinoffs". ThoughtCo. Retrieved July 19, 2018. In a lot of ways, a remake and a reboot are similar concepts. They are both brand-new versions of previous movies. However, "reboot" is more commonly used for film franchises, while "remake" is more often used for stand-alone movies. ^ "Hollywood's 10 Best Reboots". IGN. 21 September 2012. Archived from the original on 19 July 2018. Retrieved 19 July 2018. ^ Peters, Ian; et al. (6 August 2012). "Reboots, Remakes, and Adaptations". In media res. Archived from the original on 19 July 2018. Retrieved 19 July 2018. ^ Child, Ben (24 August 2016). "Don't call it a reboot: how 'remake' became a dirty word in Hollywood". The Guardian. Archived from the original on 19 July 2018. Retrieved 19 July 2018. ^ Patches, Matt (9 August 2012). "The Reboot Glossary: Which Hollywood Buzzword Fits the Bill?". Hollywood.com. Archived from the original on 19 July 2018. Retrieved 19 July 2018. ^ Faughnder, Ryan (24 August 2016). "Hollywood's summer problem? Reboots people don't want". Los Angeles Times. Archived from the original on 19 July 2018. Retrieved 19 July 2018. ^ Desta, Yohana (9 October 2014). "Why Hollywood Is Producing So Many Damn Remakes". Mashable. Archived from the original on 19 July 2018. Retrieved 19 July 2018. ^ a b c d Norris, Erik (7 March 2013). "Why Franchise Reboots Can Be A Good Thing". Mandatory. CraveOnline. Archived from the original on 8 June 2018. Retrieved 6 June 2018. ^ Lorendiac (16 March 2009). "Lorendiac's Lists: The DC Reboots Since Crisis on Infinite Earths". Comic Book Resources. Archived from the original on 9 October 2016. Retrieved 20 August 2013. ^ Vasquez, Zach (23 October 2018). "Beyond the grave: what's next for the horror reboot?". The Guardian. Archived from the original on 25 October 2018. Retrieved 25 October 2018. ^ Billington, Alex (6 October 2008). "Sunday Discussion: The Mighty Hollywood Reboot Trend". FirstShowing.net. Archived from the original on 6 July 2017. Retrieved 20 August 2013. ^ Francis, James Jr. (11 June 2018). "Why did the television reboot become all the rage?". The Conversation. Archived from the original on 19 July 2018. Retrieved 19 July 2018. ^ Husser, Amy (27 February 2016). "Reboot overload? Fuller House leading pack of nostalgia-inspired TV revivals". CBC News. CBC.ca. Archived from the original on 11 August 2018. Retrieved 19 July 2018. ^ Swarts, Jessica (April 12, 2016). "We've listed a few 'Twilight Zone' Remake Episodes which aren't terrible". Inverse. Retrieved July 19, 2018. ^ Otterson, Joe (6 December 2017). "'Twilight Zone' Reboot From Jordan Peele, Simon Kinberg, Marco Ramirez Greenlit at CBS All Access". Variety. Archived from the original on 19 July 2018. Retrieved 19 July 2018.